A Bennett buggy, 1935. Source: Wikimedia Commons. 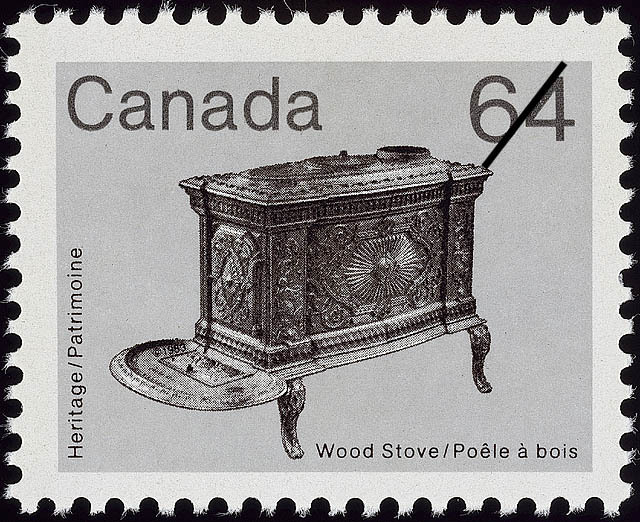 This is the second in a series of five blog posts edited by Andrew Watson highlighting the work published in a special issue of the Canadian Journal of History/Annales canadiennes d’histoire (CJH/ACH) on the Material Realities of Energy Histories. Each of the articles in the issue will be available open access for four weeks co-inciding with each blog post. This post is based on Richard W. Unger, “Shifting Energy Sources in Canada: An International Comparison, 1870-2000.” Each blog post will also appear on the University of Toronto Press website. Canadians are among the greatest consumers of energy per person in the world. Iceland, with abundant geothermal sources and a small population, is the only country with a consistently higher level of energy use. Even the people in the United States fall behind Canadians in consuming energy. Those living in the ‘true North’ have been leaders on the planet for the last two centuries and probably even longer. Until the first decade of the twentieth century the majority of that energy came from fuelwood. Industrialization promoted a shift to fossil fuels. By 1903, coal supplied more energy than fuelwood. By 1955,oil exceeded coal as a source of energy. And by 1996, natural gas passed oil as an energy source for Canadians. In 2000, oil and natural gas provided almost equal amounts of energy while primary electricity, produced by wind or water power, supplied a bit more than half of either of the other two. That pattern of a series of shifts through fossil fuels was typical of countries in North America and western Europe over the last 150 years. Whatever the source, Canadians used a lot of energy. Energy consumption per person in Canada was already high compared to other jurisdictions in the world through the first half of the twentieth century. Surprisingly, and despite the established position of the country as a leader in energy consumption per person, people in Canada began to use considerably more through the 1960s. 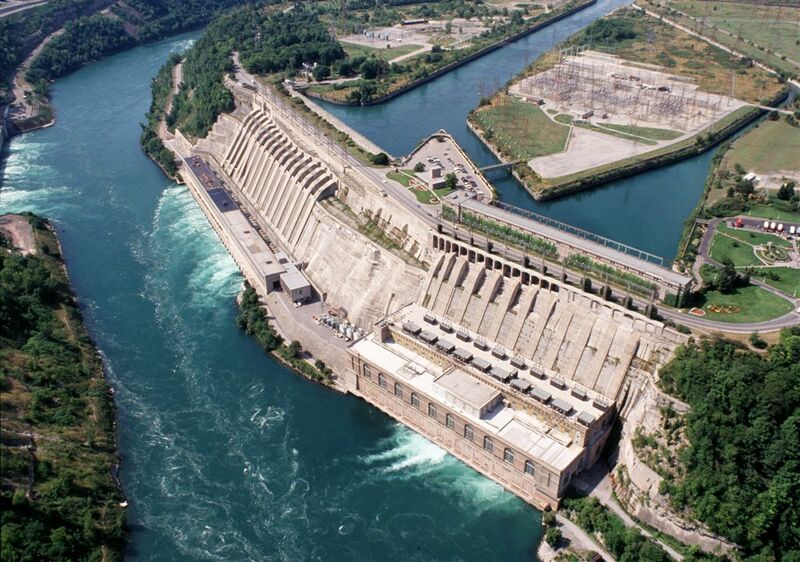 Between 1958 to 1973, per capita energy consumption in Canada rose 74 percent. Countries in Europe saw sharp rises in energy use starting in the 1950s. Many of them were recovering from the destruction of World War II and also from the massive disruption in their economies that were created by the war. It was also a period when the full force of the Industrial Revolution reached parts of southern Europe,where a more traditional and agrarian economy still dominated. 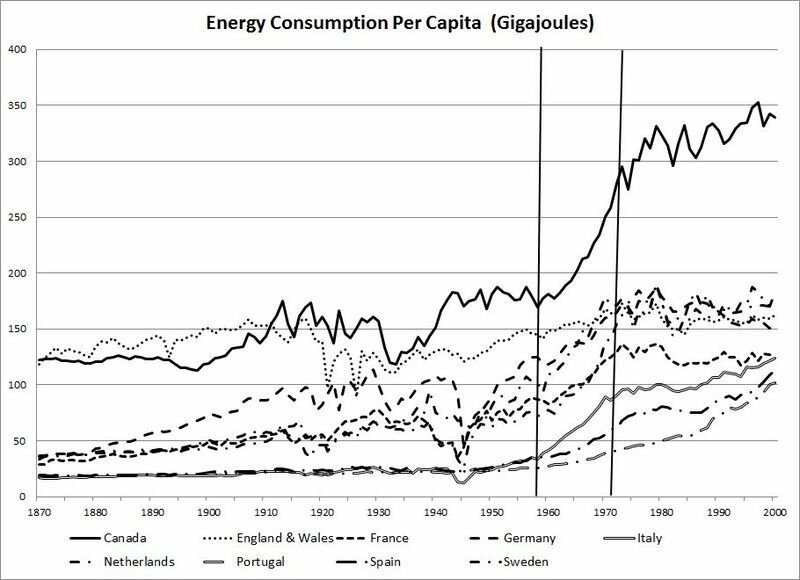 In the years from 1958 to 1973 energy consumption in Canada moved rapidly higher, extending even more its lead over eight European countries which were enjoying rapid economic growth in those years. The Athabasca Tar Sands in Alberta, known since the eighteenth century, have long been thought a potential source of petroleum. 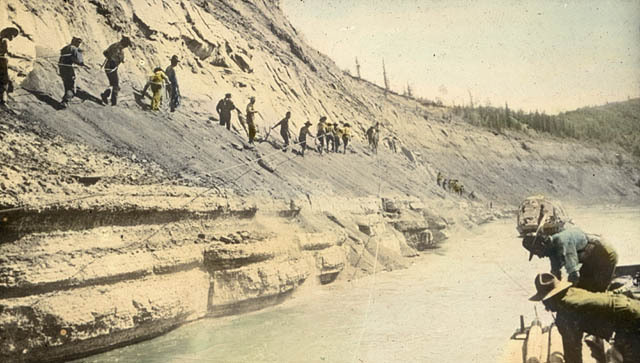 Efforts like those shown here between 1900 and 1930 to exploit the abundant reserves proved futile. Technological advances and rising oil prices only made that possible in the latter years of the twentieth century. Library and Archives Canada, 3592868.